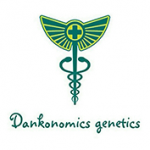 Dankonomics Genetics - Chocolate Tooth. Free US delivery. Chocolate Tooth is a new strain from Dankonomics and is a cross of a Gorilla Glue clone (exact pheno-type unknown) and Sweet Tooth #4. It is a mostly indica cannabis strain with high to very high production of THC. Recommended as a medical strain. Chocolate Tooth is suitable for growing indoors, outdoors and in a greenhouse. The length of flowering varies with pheno-type but will be between 6 - 9 weeks while northern hemisphere harvests outdoors will be during the month of October - not a strain for those regions that are likely to experience an early onset of bad weather. This strain can present some difficulties for the newbie grower, especially the stickier, gluey examples, although those with some previous harvests under their belt will find an interesting strain to work with and one which can deliver very impressive yields. The flavour of this weed variety is very complex and ranges from chocolate/cocoa to sweet candied fruit (blueberries and grapefruit) via the unmistakable funky aroma of a freshly-opened set of tennis balls. THC production is in the range 18% - 26% with CBD of up to 3%. The effect is incredibly potent with a hard-hitting euphoric high that provides bodily relaxation too. Therapeutic use is indicated for both day and night-time use and eases symptoms of ADHD, nausea and it is also good for pain relief.